Hey guys, a quick message! Some readers have been asking me for a while if there was a way to support me other than Patreon, since not everyone uses it. One reader suggested opening up a Paypal link to act as a sort of "tip jar" if somebody wants to drop a dollar or two to help support the comic. I was a little reluctant towards the idea at first, but I thought about it and figured that if a few people like my work enough to want to send a small donation my way, I should be thankful not hesitant. I am very, VERY thankful to all my readers! I'm especially thankful to my Patrons who have supported my work; from the largest the smallest donations. Every one is a massive help in letting me to focus more and more on Marblegate and less and less on paid work and factory jobs. If it weren't for you guys and gals, I would be lucky if I had time to finish two pages a month! Marblegate is 100% free to read, and I intend to keep it that way forever. But for those of you who have supported my financially in the past as well as those who continue to support me now, I want to thank you so much for all your help in making this comic free for the thousands of people who read it, and for making my childhood dream of making comics for a living come true. Now why do I feel a bit of a badass moment coming along, followed by our lovely dwarf companion asking what took her so long. I don't know but I think Divine Power seems a bit much to tackle some sheep. She was just repeating a prayer her dad taught her. At this point in the flashback, she didn't have divine powers. if i had to guess i'd say its spirit guardians spell what do you guys think??? Spirit guardians is a 3rd level spell, isn't it? There's no way little Colleen could cast that as a kid. It also has to be a non damaging spell, cause she's using it against sheep in the flashback. My money is on Bless. For the record; she wasn't casting a spell back then, just repeating an old prayer her dad taught her. Well, the incantation roughly translates to "Angels, reprimand what is mine"...might be just nonsence filler text, but could be a hint on the spell effects? Close, the text translates out to "Angels, who remind me." What english-to-latin translator do you use? I need me a good one so I can give my players a "latin" puzzle. The magical translator known as Google Translate! Well, I used good old dictionary. Google Translate is wonderful tool, but has hiccups sometimes. It's good to get rough translation, but more often then not, the meaning is lost, since any given text is more then collection of words. Was Colleen born with powers or was she gifted them when she was young? You'll find out next chapter! She's the spitten image of her pappy! 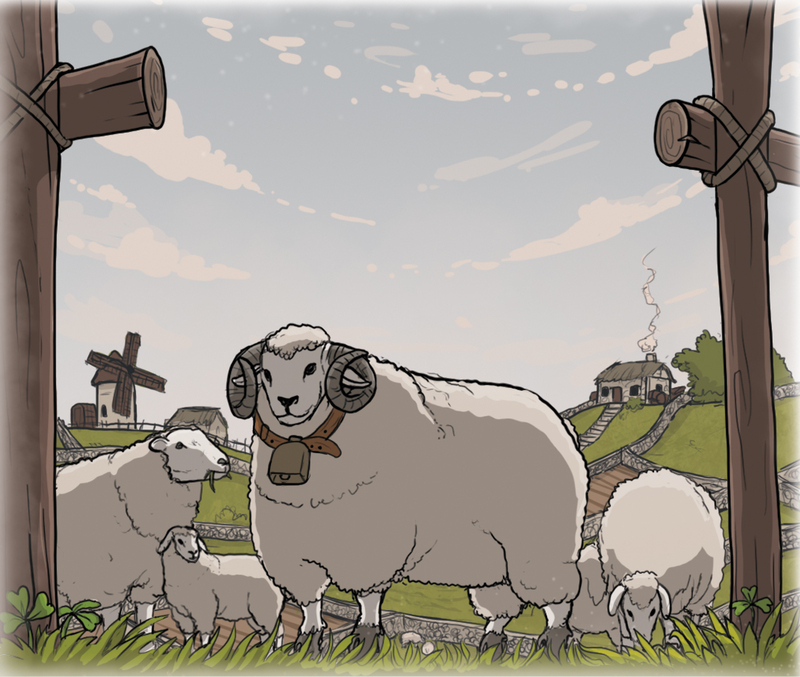 I like how you have drawn the sheeps (so fluffy) and the country side. It look like a beautiful and tranquil place to live. Why would our little priestess want to leave such a place? It's certainly not for the trill of adventures judging by her personality. Is it because she always seems to need a lots of money? Anyway, it's time to put a half brick in a sock and smash some skulls! Oh and pick up her mace, loosing your equipment is hard on the budget. Answers to these questions are coming soon! It's amazing what you can do with a half-brick in a sock. It can turn the world's worst wizzard into a force to be reckoned with. Just remember that the ram is edible. "Picture it with Barbecue Sauce on its head." Barbecue sauce? With mutton? You fiend! I get BBQ sauce on my pizza instead of cheese. No pineapple though, because even I have standards. Sheep can hurt you if you are small and thinly build. Also rams are mean if they have not have anything removed on them. Just remember lamb is just like beef, just smaller and cuter. whatever you do...dont RAM AWAY! That ram is an absolute unit! One of my favorite recent panels. I like the art in the flashback. Thanks! In awe of the size of that lad, too! I was expecting some kind of tragic thing, but this is really cool. Seems like she had a really good dad. So did Bruce Wayne, I'm sure there is some reason she left those quiet hills to become and adventurer. All of the thanks... Keep up the good work!